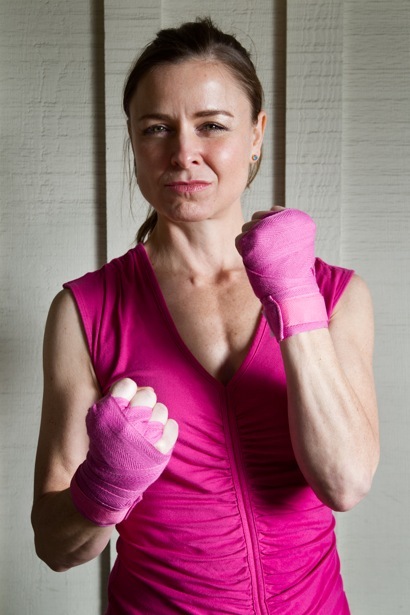 Sure, Menlo Park dentist Katherine Brown knows how to fill a cavity, but she can also throw a punch. She admits that a dentist who boxes is a bit of a strange mix. “Guess the only worse hobby would be playing ice hockey,” she acknowledges. Kate, as she is known by friends and family, fell into boxing much like she fell into dentistry. The commonality is “always wanting to do something with my hands,” she says. She moved to California to pursue a career as a chemist. But while she’d get her work done, some of her colleagues did not, given the amount of socializing instigated by her. So, she left the company she was working for and enrolled at UCSF dental school. “It was about halfway through dental school that it occurred to me that I just might like being a dentist,” she recalls. She practices general dentistry in her downtown Menlo Park office where she’s been for about two years, following five years in Atherton, and another seven years elsewhere. She started boxing last summer. “I was working with a trainer at Pacific Athletic Club and was getting a bit bored with my workout,” she says. “One day I noticed he was wearing boxing gloves and found out he was a professional boxer. “I tried it once and got hooked. I didn’t know how to throw a single punch when I started, but I’ve gained the rudimentary basics. Kate now boxes twice a week during the evening with a group that includes a 70-something-year-old male retiree, a 60-something woman who works at Oracle and a 40-year-old nurse. About those pink-trimmed boxing gloves and hand wraps: That’s the color that women’s small gloves come in, explains Kate.